Password policies work in an inverted pyramid, from general to specific. A global password policy is superseded by a subtree-level password policy, which is superseded by a user-level password policy. Only one password policy is enforced for the entry; password policies are not additive. This means that if a particular attribute is configured in the global or subtree-level policy, but not in the user-level password policy, the attribute is not used for the user when a login is attempted because the active, applied policy is the user-level policy. 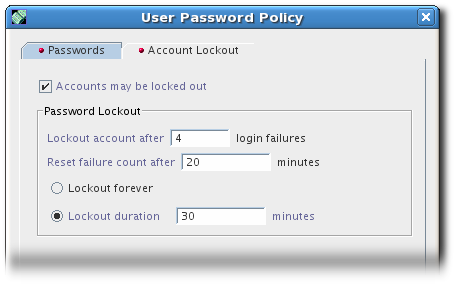 After configuring the password policy, configure an account lockout policy. For details, see Section 19.8, “Configuring a Password-Based Account Lockout Policy”. For the server to check the syntax of a user password to make sure it meets the minimum requirements set by the password policy, select the Check Password Syntax check box. Then, specify required password complexity, such as the minimum length and required number of numeric and special characters. For a list of supported password storage schemes, see the corresponding section in the Red Hat Directory Server Configuration, Command, and File Reference. For further details about the parameters, see the Red Hat Directory Server Configuration, Command, and File Reference. Enable a fine-grained password policy globally, as described in Section 19.4.1.1, “Configuring a Global Password Policy Using the Console”. Be sure to check the Enable fine-grained password policy check box to allow user-level password policies. The global password policy does not override the local policy if they differ. 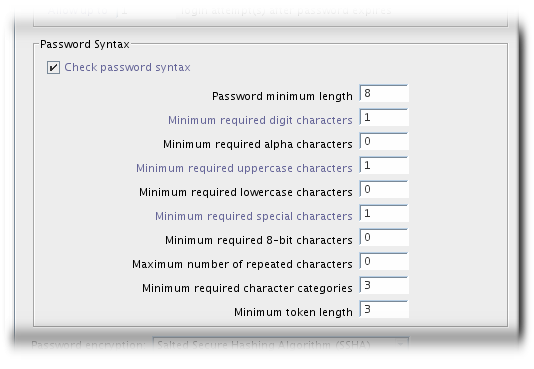 In the Passwords tab, select the Create subtree/user level password policy check box to add the required attributes. The password policy settings — resetting, expiration, syntax, and encryption — are the same as for the global policy in Section 19.4.1.1, “Configuring a Global Password Policy Using the Console”. For updating a subtree entry, use the -S option. For updating a user entry, use the -U option. The ns-newpwpolicy.pl script accepts only one user or subtree entry at a time. It can, however, accept both user and suffix entries at the same time. For details about the script, see the Red Hat Directory Server Configuration, Command, and File Reference. 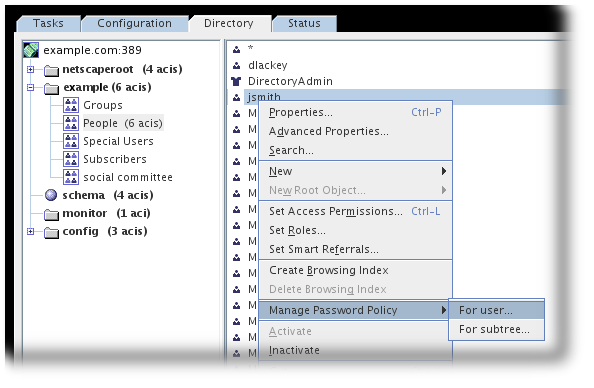 Table 19.2, “Password Policy-related Attributes” lists the attributes available to configure the password policy. The ldapmodify utility can be used to change these attributes in the subtree or user entry which contains the nsPwPolicyEntry object class.